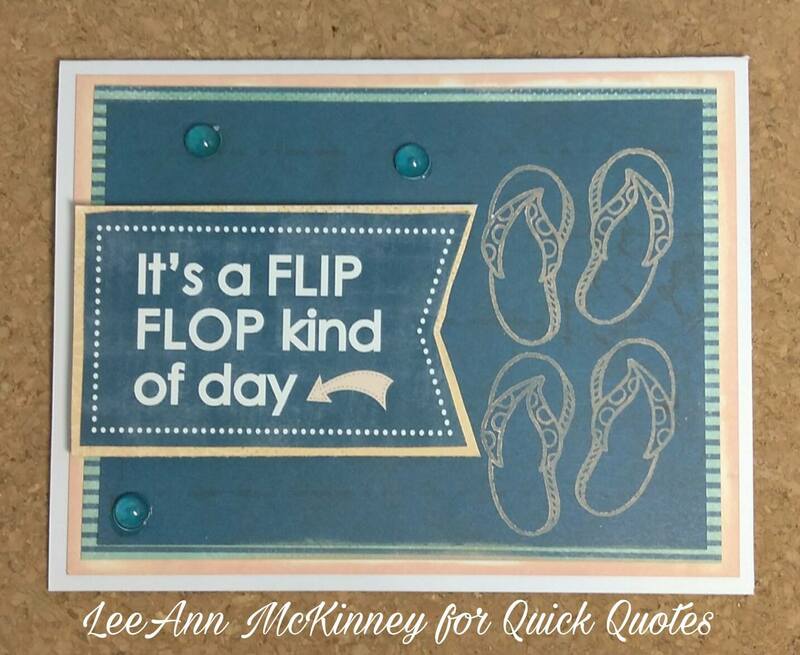 Greetings friends and fellow crafters, LeeAnn here today with a fun project. I have really fallen in love with two of our paper packs and find myself using a lot of it, so happy to have them both here. Adventure Awaits and Anchor's Away are really finding their way into many of my recent projects. I really hope you find I am doing them the justice they deserve. On to today's project. I sat and thought about what I wanted to do, and decided to start looking at the Anchor's Aweigh sentiment sheets first. 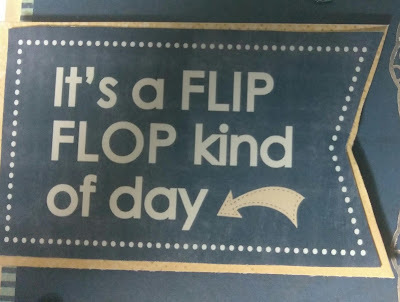 Well the quote box that jumped at me was Flip Flop Kind of Day, and I remembered this cute stamp set I have that I used last month with my clock project. The set has a pair of flip flops as well. SO, I grabbed my paper box, went through and found some Adventure Awaits pages that I wanted to use with this project. Process to make project: Using Adventure Awaits 105, I cut one panel 5.25 x 4 and from Adventure Awaits 101, I cut 2 panels, the striped side panel is 5 x 3.75, The night blue panel is 4.75 x 3.5. 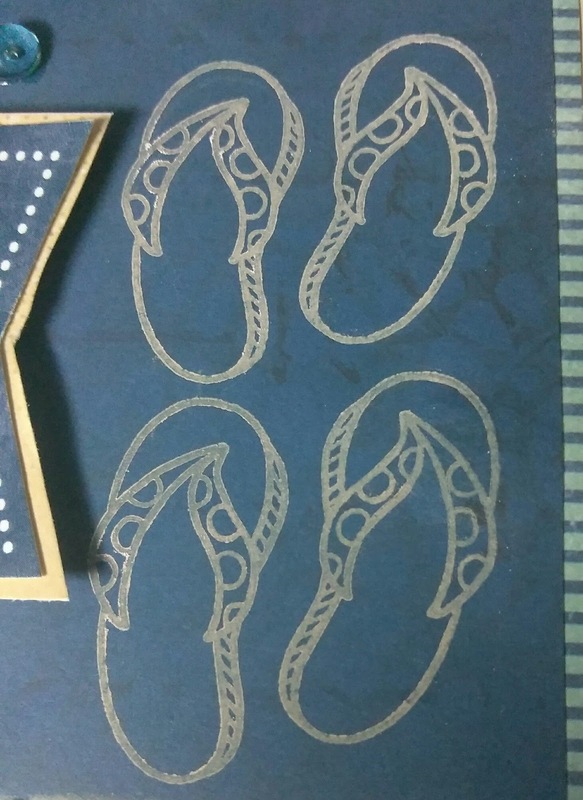 Using my stamp positioner I used Peach Tree Powderpuff Chalking Ink and stamped the set of flip flops, I then repositioned the panel and stamped them again. After this I set the panel aside to dry. I also took that initial cut panel from 105 and inked the edges with the Peach Tree as well. Using double side tape I adhered the 105 to my card base. I then adhered the striped layer from 101, and then the stamped layer also from 101. At this point I cut the banner quote from Anchors Aweigh 500 and affixed it to a cut out from the 105 page and banner cut it to match the quote. Using foam tape I adhered it to my card. Using On Point Glue I adhered 3 aqua dots around the card. I really hope you have enjoyed this project. 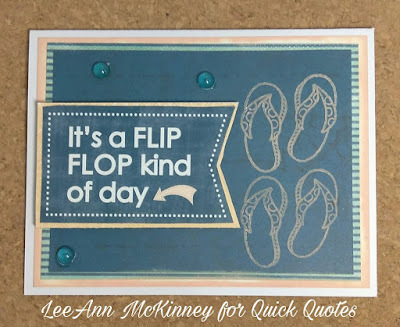 My oldest daughter loves her flip flops and this card will be in the mail to her when this post goes live. Have a great day. Please be sure to check out and enter this month's Friday Challenge, all information for that is here.